Shrewsbury Friends of the Earth has dropped its bid to force a judicial review of Shropshire Council’s contract with waste management giant Veolia. The environmental group said it had concerns about the costs it would face if it lost the case. It means Veolia will now be able to go ahead with the start of work on the incinerator in Battlefield, with construction scheduled to start in the next few weeks. Dave Green, a spokesman for Shrewsbury Friends of the Earth, said the group had decided to drop the appeal after being warned by Shropshire Council’s lawyers that it would be pursued for costs. The organisation had lodged papers with the Administrative Court in Birmingham and was waiting for a decision on a protective costs order, setting a maximum limit for what they could be charged. The FoE had wanted the building of the incinerator to be postponed to allow the financial case for the Energy from Waste facility to be examined by an independent judge. But before the costs order decision was made, the organisation agreed to drop its overall case after assessing its chances of success. Mr Green said: “Obviously we are very disappointed but sometimes you just have to be realistic. He said the decision was not taken lightly. “It was an assessment of the risks we were taking against the likelihood of success. 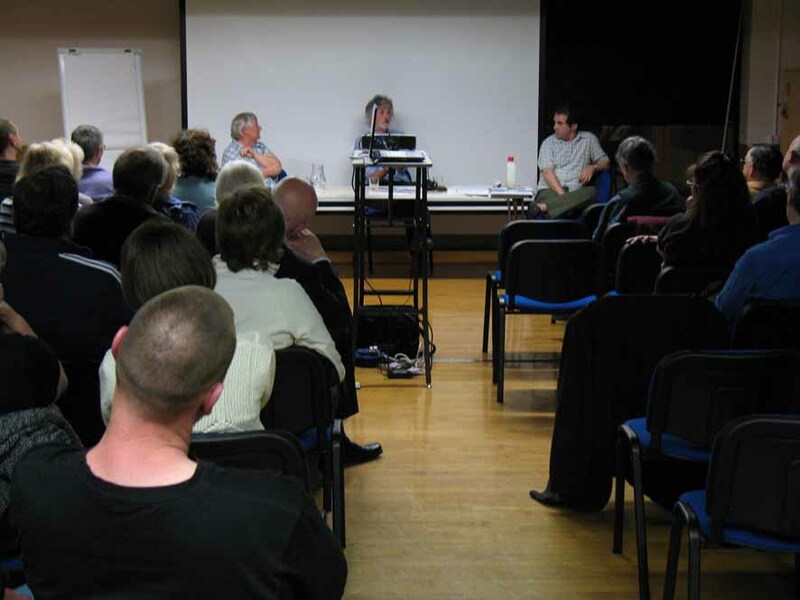 Shrewsbury Friends of the Earth was one of the groups that opposed the building of the incinerator at last year’s public inquiry. The incinerator is scheduled to be open by 2015 and will deal with 90,000 tonnes of waste a year. 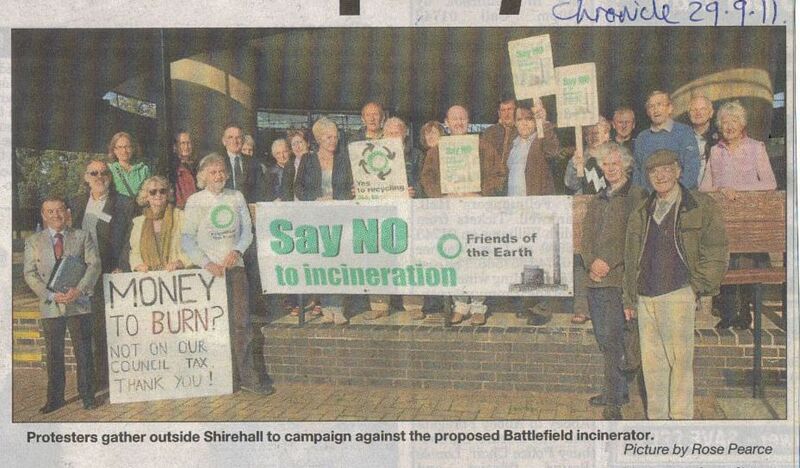 Legal Challenge To Battlefield Incinerator being launched. 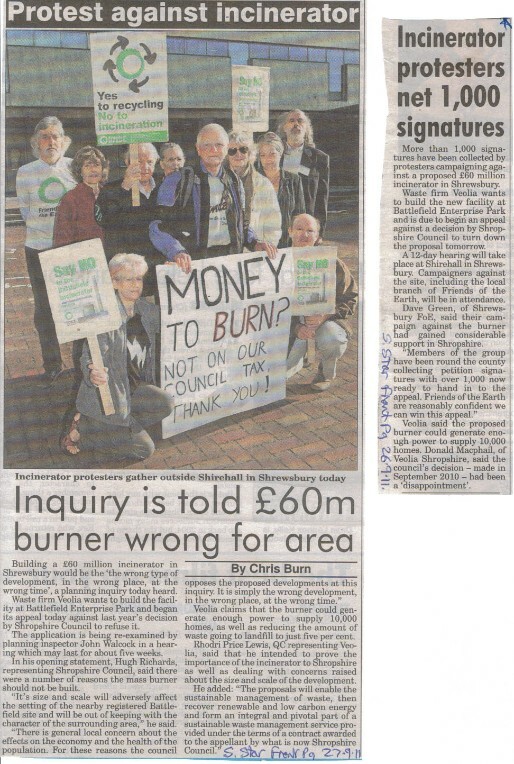 After months of frustration trying to get Shropshire Council to review the case for building the incinerator before it's too late we're launching a legal challenge. 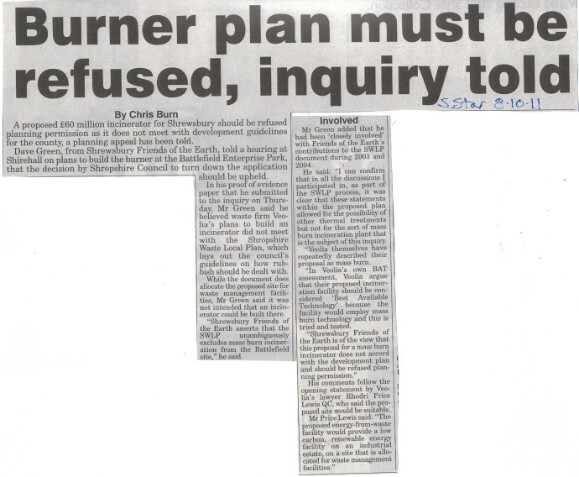 Since the original decision to build the incinerator was taken in 2007 there have been a number of changes which will affect the finances of building and running the proposed plant. 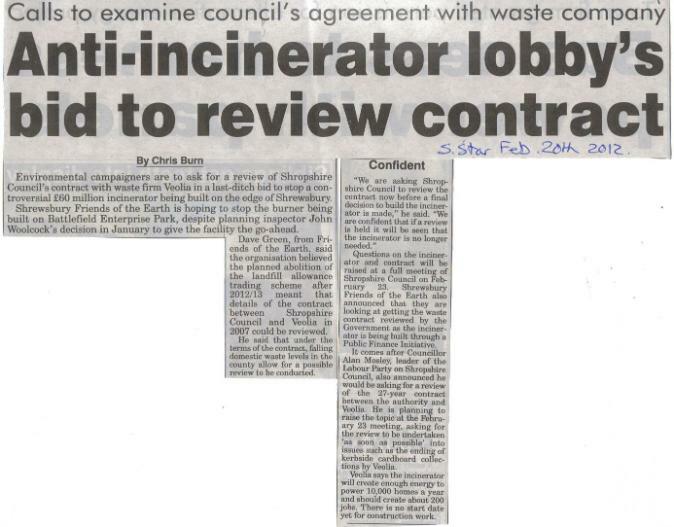 the construction of several other incinerators in the West Midlands. No business could afford to go ahead with such a major decision without reviewing the financial case but SC have flatly refused to do so. 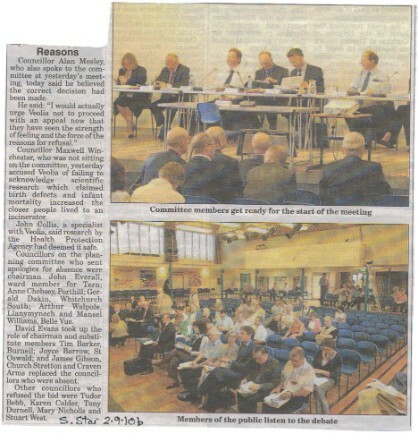 Hopefully the legal challenge will bring them to their senses..
At the public inquiry the alliance of Shropshire Council, Battlefield 1403 and ourselves (backed up by Michael Ryan, Steve Boulding, Nick Hall, Barry Haines and others) put up a rigorous, intense, detailed and reasonable defence of the planning committee's rejection of the proposal last year. Many thanks to Keith Kondakor (especially), Tim Hill and Shlomo Dowen who all contributed hugely to our campaign with either little or no remuneration. Thanks also to all the S.FoE group members who helped out and all those who've donated to our fighting fund. Nationally, waste figures are going down after having been steady for 3 years. DEFRA figures just released show that 90% of local authorities are meeting or exceeding their recycling targets, including Shropshire. And compared to other countries, we’ve hardly even started! 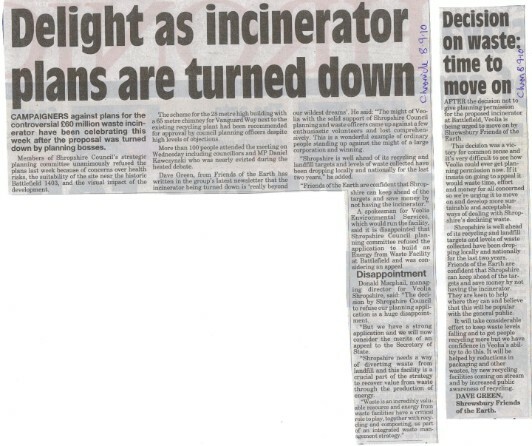 Incinerators need to keep going all the time. 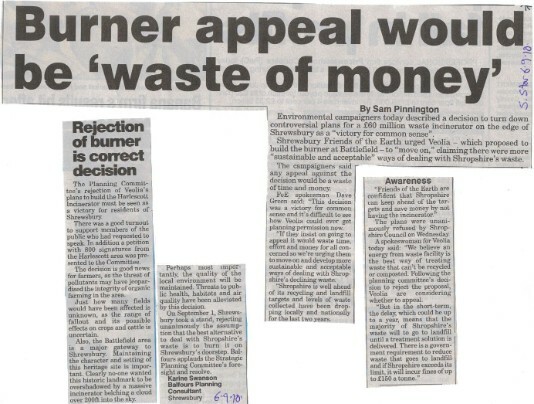 With waste figures dropping, there is no incentive to encourage recycling, which would provide less for the incinerator. The message will be that it doesn’t matter if we throw stuff away, it will just get burnt. The incinerator will provide some energy, but nowhere near as much as will be wasted by destroying materials. As the recent panic shows, oil will get increasingly expensive, as will metals. Biofuels are in short supply, and we can use all the wood, plastic and metals we can get. If they’re burnt, we can never recover them. in full view of the Battlefield Heritage site. if the incinerator gets built we’ll be stuck with it for 25 years. DON’T BURN OUR RUBBISH, RECYCLE IT. Derby Incinerator appeal won by campaigners. 19th Nov 2010. The decision against the Derby incinerator (which would have combined a materials sorting facility and advanced thermal treatment) has been backed up on appeal. 3, effect on living conditions, particularly air quality (the area already ahs significant air quality problems). and lastly "and the facilities appetite for waste could divert effort and resources from waste reduction, re-use and recycling"
We trust that Veolia and Shropshire Council are studying the report very carefully. INCINERATOR TURNED DOWN - UNANIMOUSLY! This really is beyond our wildest dreams. The might of Veolia with the solid support of Shropshire Council planning and waste officers came up against a few enthusiastic volunteers and lost comprehensively. This is a wonderful example of ordinary people standing up against the might of a large corporation and winning. Surprisingly health and siting issues featured largely in the debate but the fact that the proposal was against the Council's own Waste Local Plan was also significant and will give the decision some clout. Veolia may well appeal the decision but it's difficult to see how they can get over the hurdles now placed before them. Really they should have the good grace to concede defeat, not waste any more of their shareholder's money and get down to developing sustainable and acceptable ways of dealing with Shropshire's waste. they'd get S.FoE's wholehearted support for that. 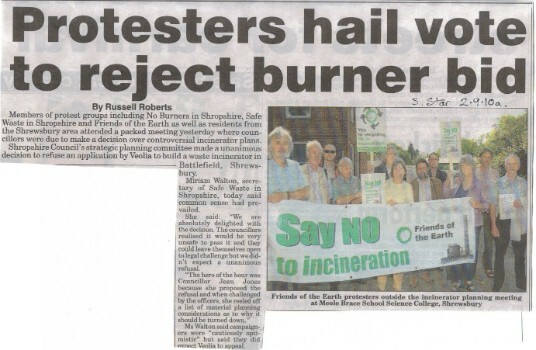 Our thanks go to all those who've worked hard on this campaign particularly our partners in NOBIS and Safe Waste in Shropshire, our MP and Councillors Mosley, Winchester, Wild and Price who all spoke well from the floor at the meeting, and to UK Without Incineration and National FoE who gave valuable support. Is Veolia’s Proposed Battlefield Incinerator Mass Burn or not? 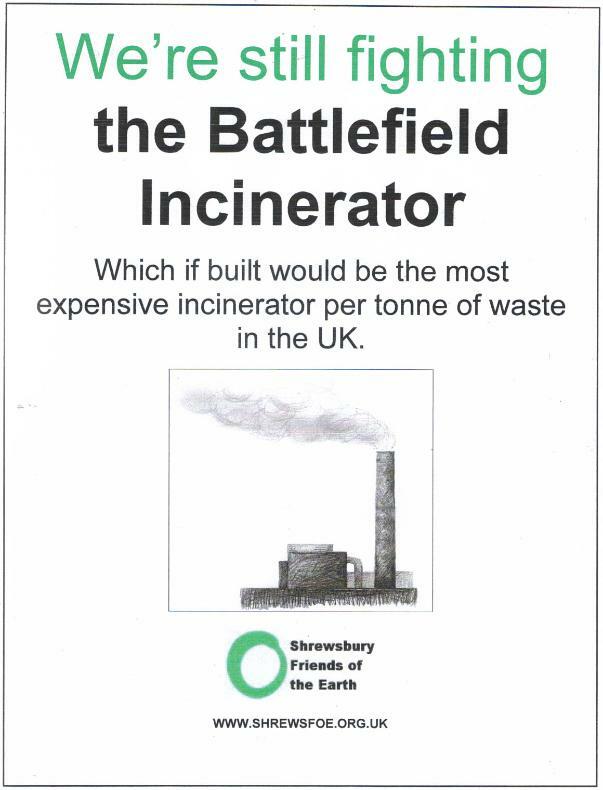 The Shropshire Waste Local Plan of 2005 specifically rules out mass burn incineration for the Battlefield site. The officers’ report on the proposal tries to get round this by stating that ‘at the time of the preparation of the WLP mass burn incineration and EFW proposals commonly involved throughputs in excess of 250,000t/a. A facility of this size would have necessitated importation of waste from outside of Shropshire in conflict with the proximity principle. However application of EFW technology has progressed in the last 5-6 years and facilities with smaller outputs have become more feasible’. (pg 77 - this version slightly paraphrased). “Mass burn incineration typically involves waste throughputs of between 10 and 50 tonnes per hour, with other types of incineration dealing with throughputs of around 1 to 2 tonnes per hour (Williams 1998). The Battlefield proposal is designed to operate at 12 tonnes per hour. Also the same sized facility at Chineham (which the Battlefield design is based on) received planning permission in 2000. 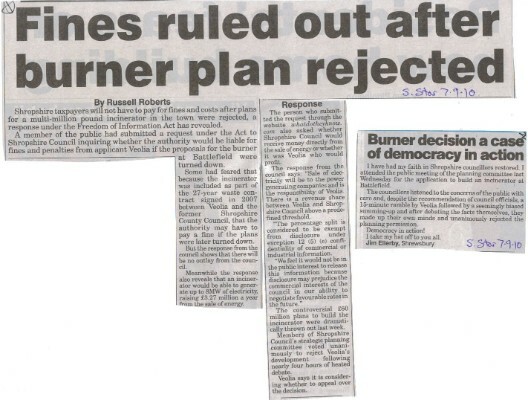 So whilst it may be a small mass burn incinerator the Battlefield proposal quite clearly comes into that category, as defined 7 years before the WLP was agreed. A small jockey is still a jockey. The officers also argue that the WLP is site specific not technology specific. Whilst this may generally be the case for this site one particular technology was ruled out. We see no reason to change this very reasonable provision of the WLP. * Williams P, 1998. Waste Treatment and Disposal. John Wiley and Sons, Chichester. Shropshire Waste Partnership (Shropshire County Councils) awarded a 27 year contract for household waste collection and disposal to Veolia Environmental Services. The contract puts great emphasis on recycling and composting, and Shrewsbury FoE have no argument with this. We do believe, however, that the targets for recyling could be much higher. They state that they will aim for at least 50%, we think it could easily be more. North Shropshire is already achieving 57%. In addition, the current climate of opinion is changing, with Tesco promising to reduce their own packaging by 25%, all supermarkets saying they will reduce the distribution of plastic bags (although this does not seem to have got through to the check-out staff), and the packaging industry reporting a 14% reduction this year. Incinerators need a minimum of rubbish to operate. To meet demand, local authorities are abandoning recycling and waste reduction plans. Recycling saves far more energy than is generated by burning waste because it means making less new things from raw materials. Smoke, gases and ash from incinerators can contain harmful dioxins which are a cause of cancer. They also contain heavy metals such as mercury and cadmium. European laws are forcing the Government to send less waste to landfill and the landfill tax is rising to deter businesses and local authorities from landfilling waste which could be recycled. The money raised from landfill tax should be used to get our recycling and composting rate up as high as other parts of Europe, such as Flanders in Belgium which recycles over 70% of household waste.